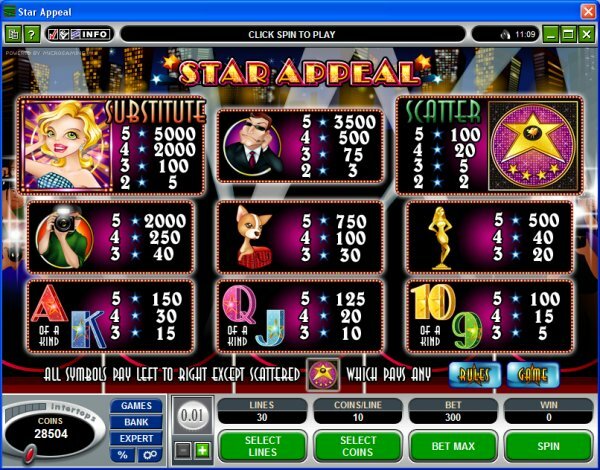 Overview: November 2008: Taking the Oscars at this month's new game awards is a big 5 reel, 30 pay-line slot with all the glitz and glam of Hollywood and the big screen, and opportunities for reward to match: STAR APPEAL. With a glittering starlet as the Wild and a Hollywood Walk of Fame star of honor as the Scatter, there can be no doubt that the theme here is Tinsel Town and its larger-than-life celebrities. Check out the beautiful starlet and her dynamic agent and pet Chihuahuas, chased by the paparazzi and hungry for golden awards, all portrayed in crisp, vibrant graphics and wrapped around fast, smooth running slot software that's among the best in the business. 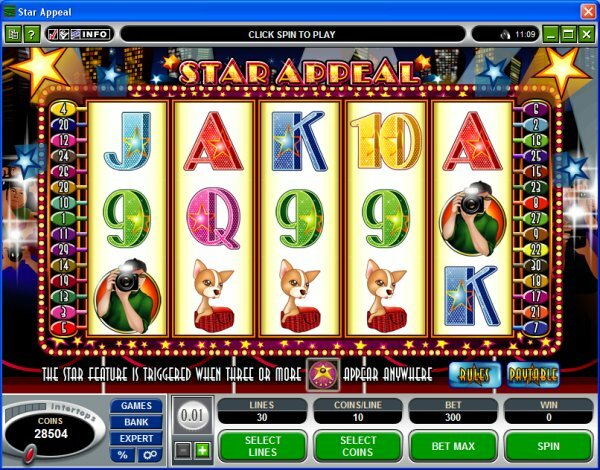 When 3 or more Star symbols appear anywhere on the reels, you are awarded 10 Free Spins and taken to the second screen Star Feature and presented with a choice of 9 Stars from which to make 3 selections, hoping to reveal additional 15 Free Spins with up to a 2x multiplier, cash prizes or the Special Substitute where more free spins are achievable. 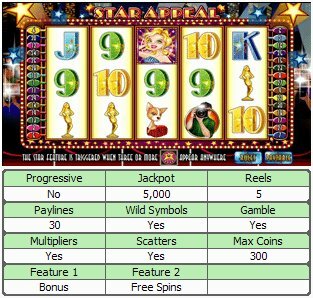 Joining these Scatter, Wild, Multiplier and Free Spin features in the Star Appeal limelight is the popular All Slots Casino Gamble feature, where the player can double or quadruple wins up to 3.2K by correctly guessing color and suit. The base game here can deliver a win as high as 12.5K in the base game and 25K with Free Spin action. So treat yourself to a night at the movies and experience Star Appeal for yourself. 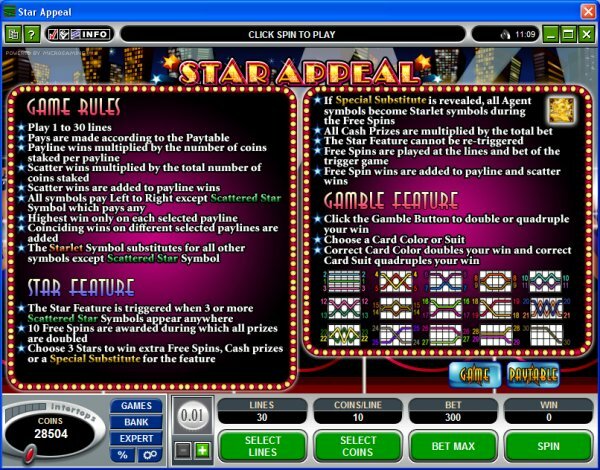 Similar Slots: If you like Star Appeal, you might like these other 5-reel slot machines: Carnaval, Crazy 80s, First Past the Post, Prime Property, Scrooge, Wheel of Wealth.